By buying this product you can collect up to 1144 bonuspoints. Vagnsset med 3 containervagnar typ DB, totallängd över buffertar 372 mm, epok IV. Prototype: Three German Federal Railroad (DB) type Sgs 693 four-axle transport cars for combined load service. 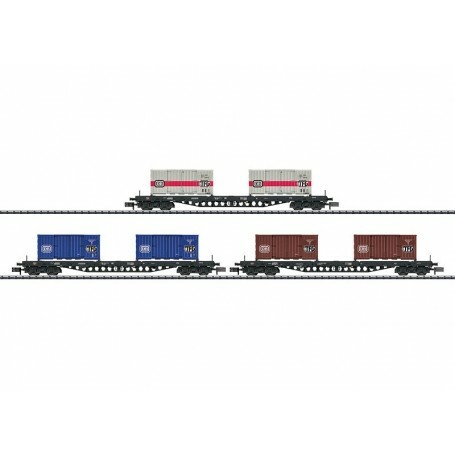 Each car loaded with 2 DB type Htt 6 domestic containers in different basic paint schemes. The cars look as they did around 1988. Model: All of the cars have close coupler mechanisms. The car frames and superstructures have details specific to the cars and separately applied details. Total length over the buffers 372 mm / 14-5/8'.